We like our recipes easy and so while I was in the grocery store recently, I realized I need to take advantage of the warm weather and GRILL more. We often grill the usuals: zucchini and peppers. While in the produce aisle, the endives caught my eye. I remember seeing that you can grill endives and so I grabbed two. When they’re raw, they look like little lettuce pods. After doing a bit of research I found out that you should cut out the bottoms (a bit bitter) just like you would with Brussels sprouts. I halved them, drizzled olive oil over the top and added some salt/pepper. Grill each side for about 4-6 minutes. Honestly it’s my new favorite veggie side! So easy and tastes a bit like a mild cabbage when grilled. The perfect side to a delicious steak. 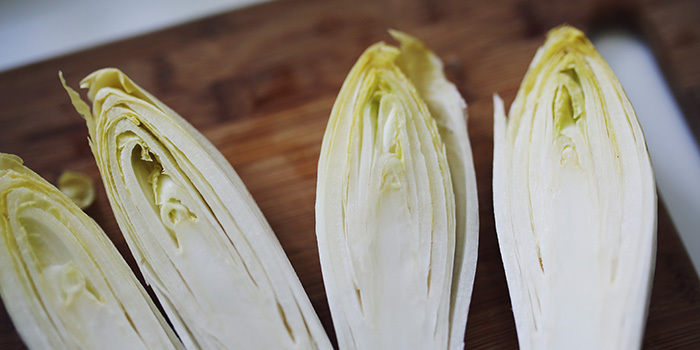 Let me know how YOU use endives! *PS: Congrats to Misty Smith for winning our doTerra essential oils giveaway!